Sunday Brunch: Button, Button, Who’s Got the Button? One of the wonderful things about social media is that a random conversation with a friend can send you down a path of memories, a veritable rabbit hole full of fragmented images and bits of conversations. Recently, someone I know mentioned something about buttons (I’ve lost the link to the original thread) and it triggered a visceral memory of my mother’s button box. My mother is a self-described “sewist,” and has been for as long as I can remember. For much of my early childhood, my clothes were handmade originals, often, when I was very young, produced from scraps of the outfits she made for herself. As a teen, I was spoiled by her ability to see something I liked in a magazine and reproduce it for me, often in the space of a busy weekend. Sewing is, to my mother, like writing and music are to me. I do not share her affinity for fiber arts. I resented every moment of standing in line at JoAnn’s or Hancock’s because there was a fabric sale and I was a warm body who could use a second coupon and increase her stash. When she visits, I dread the day she designates for fabric shopping, because the lights and the colors and the sizing on the fabrics literally make me sick. As it has been since I was a kid, my job, on these days, is to push the cart, and hunt down the patterns she wants in the great big drawers. But there is one thing about my mother’s sewing habit that has always intrigued me: buttons. My mother’s sewing desk, when I was young, was a lovely wooden piece, with a central opening that hid her black, metal, Singer sewing machine from view when not in use. It was often in a window, sun-warmed, it’s French-inspired claw feet darkened from age, but still beautiful. When the sewing machine was stowed, it was a writing desk, but somehow the wood had absorbed the special scent of pins (really machine oil, I’m told). Being near it was like breathing in the essence of my mother’s soul. My mother was most interested in what lived inside the desk – her machine. I, on the other hand, was completely captivated by the old, red, tea-tin that resided atop it: my mother’s button box. The tin has been ancient for at least as long as I’ve been alive. Bleecker and Simmons, it said on the front, those names seeming somehow mystical to me. Or at least mythical. And within its brass-colored depths? Oh, the treasures that I found! It wasn’t all buttons of course. And it wasn’t buttons that would be used in every-day projects. For making blouses or pants or jackets or… whatever… my mother would buy new buttons. A sailor-themed outfit might have plastic anchors as fasteners. A jungle print shirt would have tiny lion heads holding it closed. The buttons (and other tiny trinkets) inside the box, were one-offs. An extra button from a new dress, a lost button from a favorite jacket. A metal button that was leftover after a project. An ancient clip-on earring that might one day be turned into an ornament for a hat or lapel. A jingle bell that had probably been part of one of my ballet or Halloween costumes at one point. That tiny red tin seemed to hold endless wonders, each with its own history, its own future, its own magic. My mother’s button box lives in my house now. I keep it on the dresser in the guest room, so she can see it when she comes to visit. It didn’t make the cut when she was packing to move to Mexico nearly twenty years ago, but neither of us could bear to just toss it away. Sometimes, I think about discarding the buttons that are in it now and starting my own collection of tiny objects. But mostly, I just like that it’s there. It’s a lesson in object permanence – we may not have pictures of many of those garments, but that doesn’t mean they didn’t exist – but it’s also a glimpse into my mother’s soul, and a reminder that while our creative outlets are different, the need to create connects us both. Postscript: As this is my final “Sunday Brunch” piece, I just wanted to take a moment to thank all of you who have read my stuff both here, and in All Things Girl over the years. Your support has meant so much. And for my fellow editors and contributors, I look forwarding to reading your work in other places, and enjoying it as much as I’ve enjoyed all the words and images you’ve shared here. It’s four AM on Monday morning, but it’s not the storm outside that wakes me. Rather, I’ve been pulled from sleep because the end of a dream came at the same time as my smallest dog, a twelve-year-old chihuahua, is informing me that he needs to go out. My husband deals with the dog. I try to make sense of the dream. At one point, I saw the name Margaret, and I realized that some of the clothing being gifted to me had been meant for her, for this mysterious girl who never appeared. I think she was the deceased daughter of the old woman, a woman who felt like family, but whom I couldn’t identify. As dreams go, it’s not scary or stressful, but it sticks with me, and I wonder where it came from. I pick up the phone and leave a message for a friend asking her to ask me about the images from the dream. My husband returns with the dog. I go back to sleep and have a deliciously smutty dream about characters from Star Trek: The Next Generation (don’t judge), but the other images linger into the next day, and stay with me all week. It’s when I enter the kitchen two days later that a connection is finally made. Dishes. Dishes sparked this dream. I move into the kitchen and pick up one of the platters. It’s worn with age and manages to be both sturdy and delicate at once. Nothing dramatic happens. I’m not zapped back into my dreamscape. No ethereal beings appear in my house to tell me their story. And yet, I feel a sense of history and connection. I don’t believe in ghosts in the traditional sense. I don’t believe there are actual spirits trying to speak with us or attempting to resolve unfinished business. I know there’s nothing supernatural about Ouija boards: the planchette moves because of something called the ideomotor effect – unconscious, involuntary actions in response to prior suggestions, expectations, and preconceptions. But I do believe that objects and places retain the essences of people who owned or inhabit them. Houses take on the tones of those who dwelt within. And maybe dishes retain something of the people who chose them, and loved them, and passed them down to their children’s children. 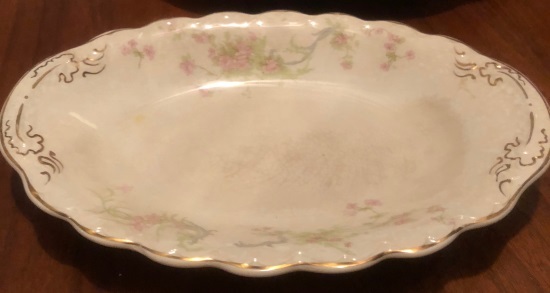 My dream remains with me, still, a week later, and I’m no closer to picking it apart than I was when I first woke up, but I now know that the china I received is from an English company called Johnson Bros, and is likely one of the first patterns they sold. Perhaps this china is connected to the nocturnal imagery created within my mind. Perhaps my dream is merely a combination of receiving the china and watching the Stephen King miniseries Rose Red. Perhaps it’s just my vivid imagination at work, providing me with story-fodder for my annual Horror Dailies writing project. If there is, or was, an actual Margaret, I wish her well. And if there isn’t… may whatever story I eventually write honor the memory of her fictional self. There are people who enter your lives as visitors, stay a while, and then move on, and there are others who come to stay. For most of the first twelve years of my life, my immediate family was just my mother and me. Sure, she was married for some of that time, but it wasn’t a happy or healthy relationship, and a lot of our time was spent in a mother-daughter bubble that must have seemed impenetrable from outside. And then there was Ira. Decades have erased the clear memories of my first time meeting him, but I think it was largely unplanned. My mother had met him some weeks before at a singles dinner, maybe through the UU church, maybe through Parents Without Partners, but that night – that night – he called asking if Mom wanted to join him to see the famous mime Marcel Marceau. He was bringing his son, and I was invited as well. I only have vague recollections of the performance. A pity, really, because Marceau was brilliant at what he did. What I remember is that I was bored a lot – a lot of the performance was a bit esoteric for a grumpy, recently eleven-year-old girl. The son had fallen asleep mid-way through the performance, and I had no one to talk to. I was also hungry. I think at some point a bagel manifested, but, for the most part, it was a seriously unimpressive evening that was capped off when we were pulled over by the police on the way home. Ira wasn’t drunk. He’d weaving because he couldn’t stay awake. Did I mention: this was their first date? I expected my mother to blow him off. I expected her to date other people. I never expected her to marry him, but that’s what happened. She would tell you, if you asked her, that it was the most unromantic proposal in the history of such things. There was laundry involved. There was no exchange of jewelry. It was almost an afterthought. I was eleven, and it was an act of rebellion. I felt unincluded and unimportant. I’m not sure what I thought would result from my action, but I knew I had to make a statement. I made a lot of statements in the early days of their marriage. What I didn’t have the self-awareness or vocabulary to express then was that I felt betrayed – my mother, who had kept her birth name for all the years of my life so far – took his name when they married. I felt like I’d been brushed aside. I felt like I was the only one making compromises. At the same time, I wasn’t ready to trust that this person, this man, would treat my mother well, would treat me well, would stay in our lives. There was a lot of adjustment. Ira wasn’t used to people who yelled, or worse, yelled back at him. I wasn’t willing to accept him as a parent. There were times I begged to go live with my aunt, or my grandparents, or be sent to boarding school. There were times when I’m sure Ira wanted to walk away from the prickly little girl who was caught in the worst part of the transition from childhood to womanhood. Every once in a while, Ira would buy a present – nothing big – an album, a book, a set of awesome colored markers – just for me. And every once in a while, I’d engage him in conversation. Over the years, those midnight cups of tea turned into midnight chats about time travel and history and why mild cheddar should be eradicated from the face of the earth, and how Jeremy Brett was the best Sherlock Holmes ever. At some point we started a tradition of going to museums together – just the two of us – on Father’s Day. We’d go to breakfast first or lunch after, and we’d get ice cream cones and not tell Mom. We went to the California Academy of Sciences and speculated about spending the night in the African Watering Hole exhibit, and we went to the Rosicrucian Museum and saw the mummy in the replica tomb. And in all that time, Ira never pushed me to hug him if I didn’t want to. 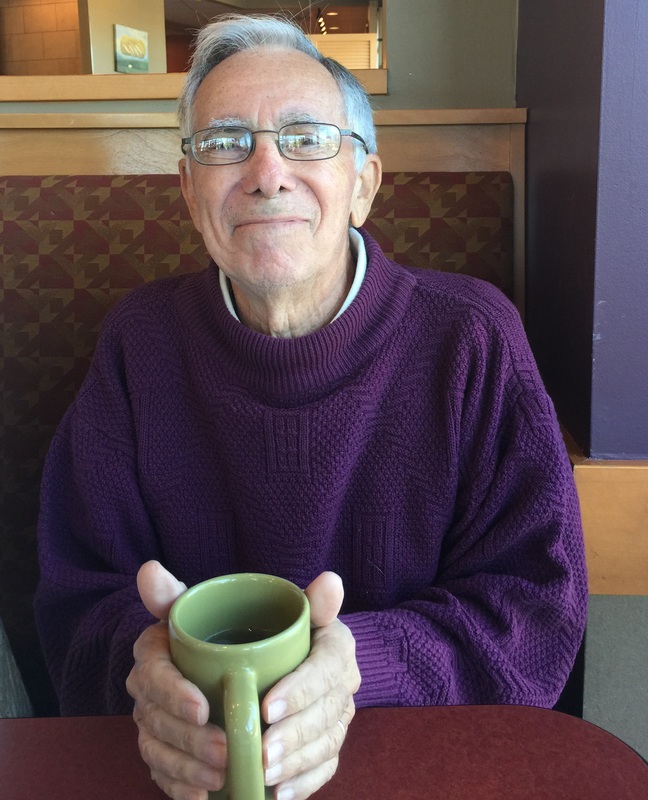 He never pushed me to call him “Dad.” He laughed at my snark and helped with my math homework, and I mocked his love of cheap kitchen gadgets bought from the discount store, and his penchant for weird food combinations (peanut butter and jelly and CHEESE?) but there was real affection underneath it all. From the time Ira entered our lives, birthday and Christmas gifts were presented from him and my mother as a unit, with a few notable exceptions. When I turned twenty-one, my mother gave me the then-current edition of Our Bodies, Ourselves, and that was just from her. And one year, after one of our museum trips, Ira gave me a pin – a brooch – that had all the animals from the safari exhibit attached as charms. He said it reminded him of our trip to the museum, and he thought I’d like it. Later, when I was planning my wedding to Fuzzy, Ira said that he’d give me away, and be honored to do it, if I asked him to, but that I should consider that it was a tradition that dated back to when women were chattel, and was that something any of us believed in? Fuzzy and I eventually eloped, and my parents threw us a party with a commitment ceremony several months later, and even though I was already technically married, I caught Ira crying when Fuzzy put the wedding band on my finger. But through all of that, I still bristled whenever someone assumed he was my father, and I would correct them, adding the word STEP. On July 11th of this year, mere hours after I came home from having the ACL, ALL, and meniscus in my left knee reconstructed, my mother told me that Ira had an infected gall bladder and they were considering surgery, but because of advanced kidney disease, his odds weren’t good. He’d been sick for a while, with different diagnoses. It was cancer. Then it wasn’t. Then it was, again – multiple myeloma. 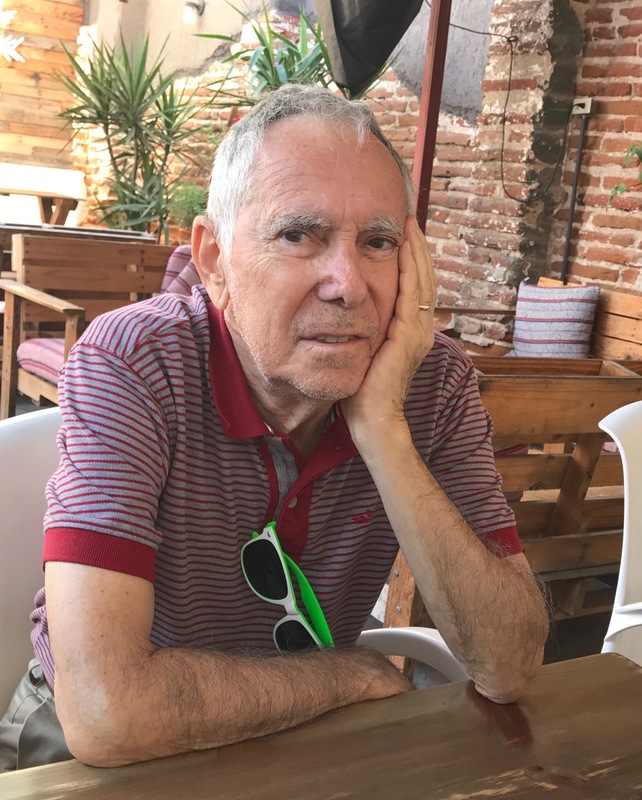 He’d been vacillating about his kidney disease – it was a sudden diagnosis and he didn’t want treatment until he was told how much time he didn’t have left. Ultimately, he had the surgery a few days later when the risk of his gall bladder bursting was too great to ignore. There were complications. There was a second surgery. Exhausted and diminished he asked for treatment to end. I waited here in Texas, because I couldn’t go to the bathroom without help, let alone travel to Mexico, where my parents retired almost twenty years ago. I waited wracked with guilt over not being able to be there to support my mother, and to say goodbye. Ira’s son was with her. And there was a near-constant flow of texts and calls. But it’s not the same as being there. So, I asked if I could write a letter – an email – and have my mother read it to him. Ira used to sing this song, one he obviously learned in school. “Stout-hearted Men.” When he was singing it, you could see the ghost of his eight-year-old self overlaying his present-day self. And I mentioned that in my letter, adding that for years I thought it was the only song he knew. Anyone can be a father, I said, because that’s an act of biology. But stepfathers – good stepfathers – they choose it. They choose to deal with the adjustments, and the fighting and then prickly little girls who don’t know how to trust men. Every day, over and over, they choose to stay. And then he chose to leave. Ira died on July 27th. Just over a month ago. He was my mother’s partner and lover and best friend and husband. He was a good father to his son, and he bent over backwards to be a good stepfather to me. He was a scientist and a scholar, but he’d happily watch hours and hours of stupid action movies just to see the explosions. He was sometimes silly and sometimes serious. He’d insist that raw veggies and leafy greens had to be part of every meal, but then he’d meet you in the kitchen in the middle of the night to sneak a piece of pie. 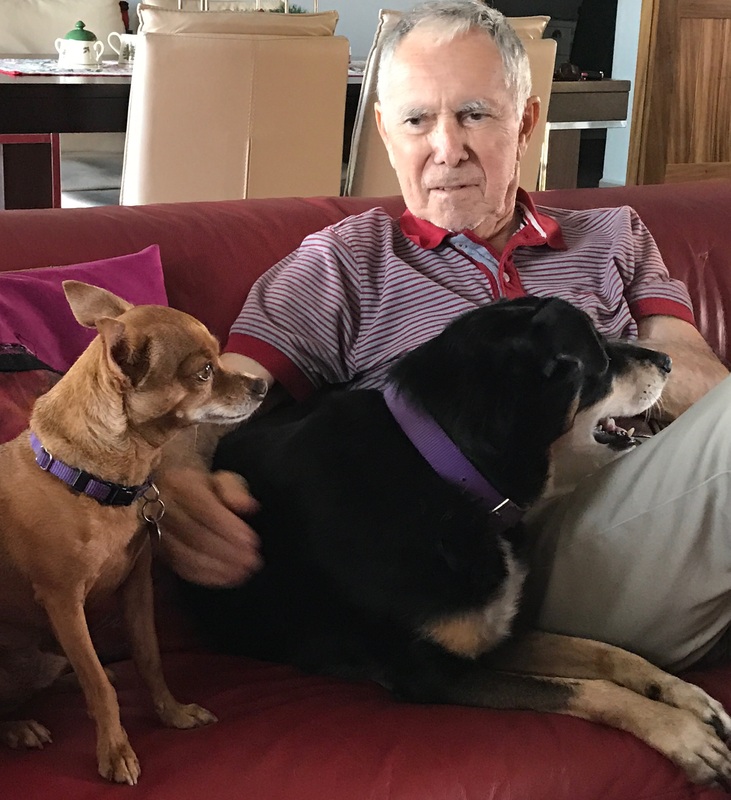 He coddled his dogs, made napping into an Olympic-level event, and gave generally useful advice. He was in the army once, when he was young, though he never saw combat. And he was the epitome of a modern, enlightened (mostly), loving, stout-hearted man. by Sigmund Romberg, Frank Mandel, Laurence Schwab & Oscar Hammerstein II. It’s not a new story, really, even though my local news station posted it on their Facebook page on Friday evening: as of today, Best Buy will no longer sell CDs (though you can still buy vinyl records in their stores) and other retailers, like Target, will be reducing their stock, selling discs on a consignment basis. This was initially announced back in February, so it’s not really a surprise, but with most media time going to sports, politics and the occasional celebrity wedding or death (not necessarily in that order) it’s no wonder that many of us missed it. Still, when my local news station asked, “Do you still buy CDs; when did you last buy one, and what was it?” I was struck by the question. The reality is, I’ve gone from a kid who grew up on vinyl (and I’m sure you can imagine how many times I’ve cursed the day I gave away my collection of Disney books & records, original pressing of “Free to Be, You and Me,” and the black cardboard case that contained the original cast recording of My Fair Lady on multiple 78s) to a teenager who recorded songs off the radio, made mix-tapes to share with her friends, and was embarrassed by her off-brand Walkman-clone. I suspect that just as I was part of the first generation to own CDs I am part of the last generation to have held a membership in the Columbia Records & Tapes clubs, which, of course, I didn’t join until it became a CD club, and which, to my ultimate shame, I still have a few CDs from sitting in the rack upstairs still in their original shrink-wrapping… this despite the fact it’s been at last a decade, and possibly two, since I was a member. Honestly though, most of my music has been digital since at least 2010, and even the CDs I own are typically ripped to my computer and added to iTunes for access from anywhere. My iPhone has become my primary listening device, especially since my desktop computer was chosen for it’s quietness. It makes it fantastic to record on, but I never bothered to put external speakers on it. Still, there are times when I really want a physical CD, and it’s not solely because of my addiction to liner notes (though, I am as big a fan of those as I am the audio commentaries on Blu-Ray and DVD movies). 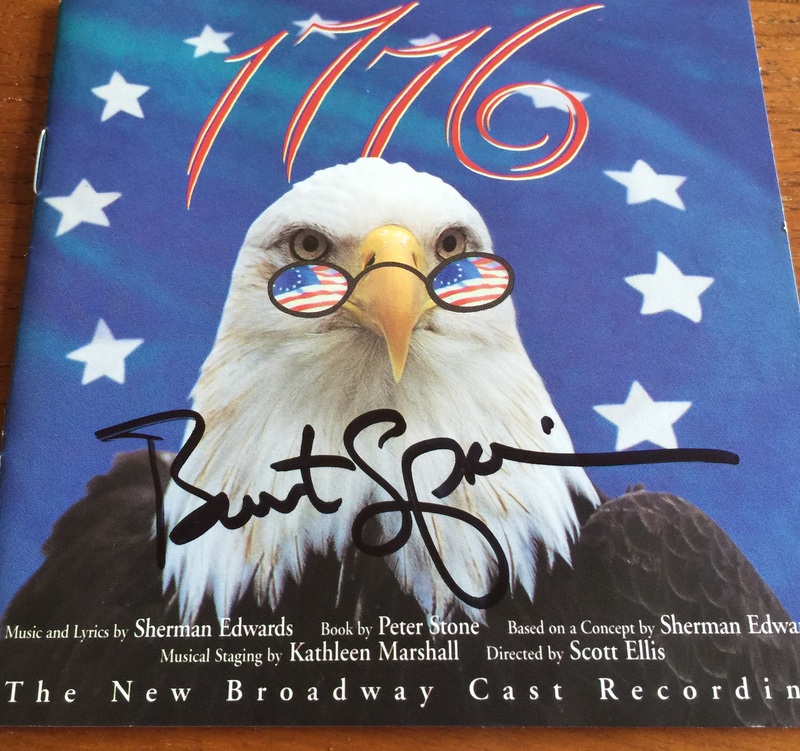 1776, for example, has long been one of my favorite musicals, so I was really excited when Brent Spiner (you know him from Star Trek: The Next Generation, Night Court, and Outcast) starred in a revival in the mid-90s. We were living in South Dakota, then, and couldn’t get to New York, but the CD kept me happy for years, and when I asked him to sign the liner notes for me at Dallas Comic-Con two years ago it led to a lovely conversation about the artwork, his time in the role, working at the Public Theatre, and how there’s a line in Hamilton: an American Musical that directly references the score of 1776. It’s the conversation that sparked our trip, a year later, to finally see Hamilton, but I didn’t buy that soundtrack on CD. 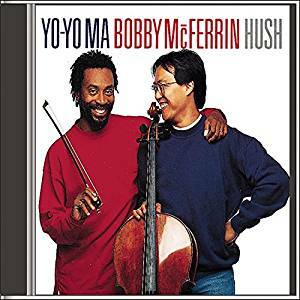 Then there are the CDs I buy, or keep, because there’s something meaningful about the artist. 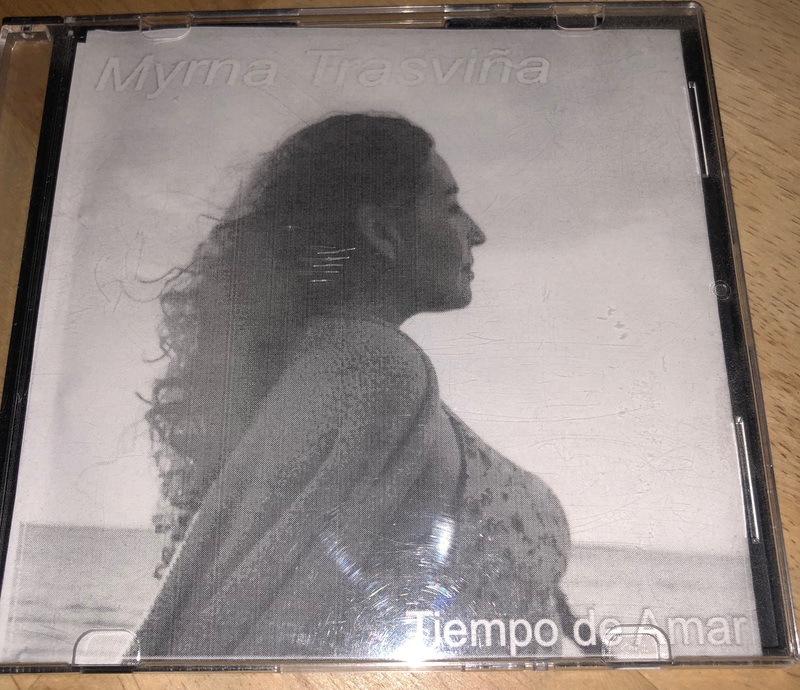 I have a CD that my parents gave me for Christmas one year, Tiempo de Amar by Myrna Trasviña. She was the singer at a favorite restaurant in La Paz, BCS, Mexico, and we all loved the simplicity of her performances as she strolled with her guitar. Her rendition of the classics “Quizas, Quizas, Quizas” is a favorite of mine. 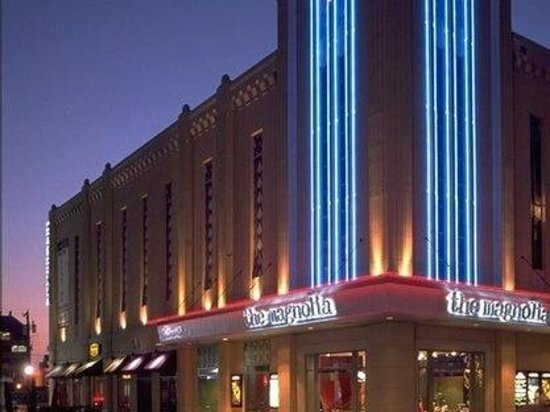 Having Myrna’s CD, the one she printed and distributed herself, doesn’t just represent access to music I love; it’s also a memory of a balmy night, a lovely meal, and a time when my parents’ time in Mexico was new and the romance of being there hadn’t yet worn off. Sure, I’d heard of Leslie because of his Tony-winning performance as Aaron Burr in the afore-mentioned Hamilton, but I bought his CD because I wanted something I could play in the car, in my office, and over the good speakers in the living room, on the sound system that is just old enough that it can’t connect to an iPhone/iPod with a lightning port. 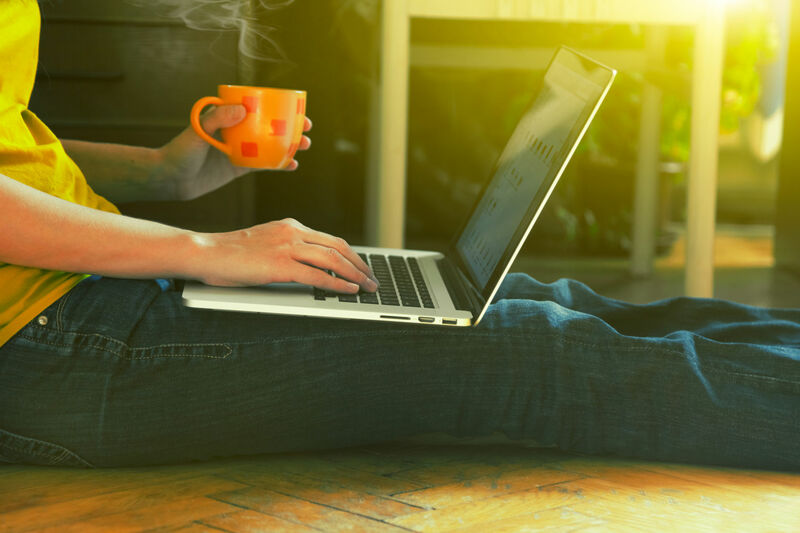 We who have embraced digital media have done so trusting that it will be there, but digital rights management comes with the ever-present risk that the Cloud might dissipate, or companies may remove favorite content. And that’s certainly something in the back of my head when I buy a physical CD, but as much as it should be a major factor in my purchasing decision, the real reasons I want an actual disc of certain music are far more ephemeral: nostalgia, meaning, and, superficial as it may be, the knowledge that I’m in possession of something a favorite artist has touched. Are CD’s a dead medium? Who knows? 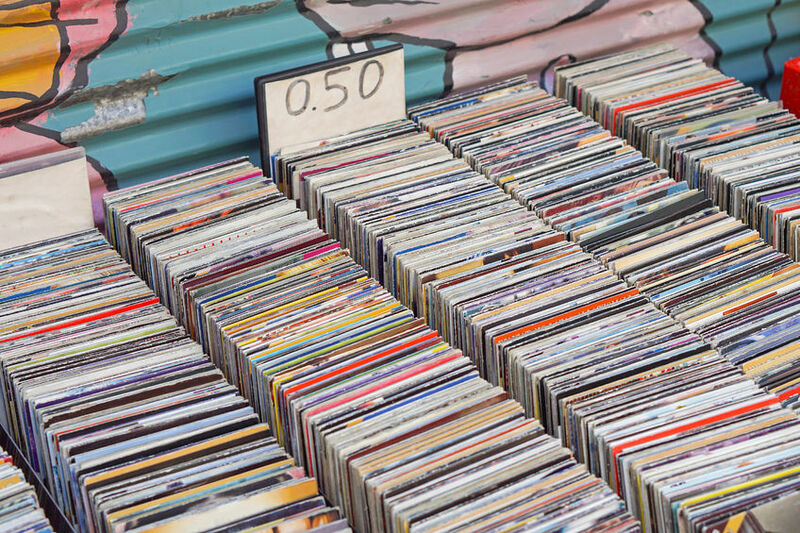 I understand that retailers must make decisions based on numbers and trends, rather than the less-than-definitive considerations I listed above, but I suspect that consumers who want tangible media will find their sources. After all, who could have anticipated that vinyl would make a resurgence? I have always loved horses. When I was little I fell in love with Marguerite Henry’s books about Misty and Phantom. 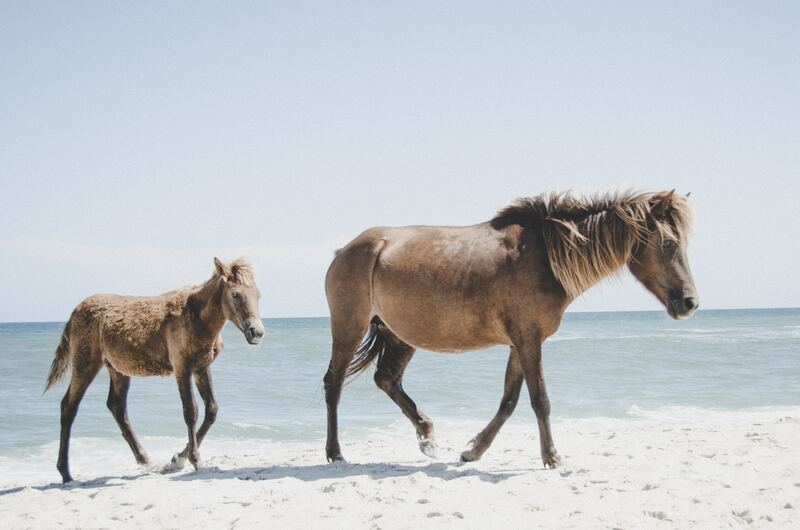 (To this day, I fantasize about seeing the wild ponies in their annual swim from Assateague to Chincoteague. ) When I was nine, my mother gave me a summer at riding camp. My two favorite ponies were Taffy and Blitzen, both retired from working on NBC television shows and living out their lives as school ponies in New Jersey. These days, I get my horse “fix” by watching thoroughbred racing and the occasional cheesy-but-relevant Hallmark movie on television, but in my head, the scent of sweet hay, the soft whickering of the ponies and the feeling of a leather saddle underneath me are as vivid as if they were real. As much as I have always loved horses, I’ve always hated roses. I don’t like the roses that come in commercial bouquets. The one’s with thorns that are genetically modified to be smaller and less “sticky,” with long stems, and vivid colors, but no aroma. But I love backyard roses. Specifically, I love my grandmother’s backyard rose bushes. I don’t know if they had specific names. I don’t know if she grew them from cuttings or my grandfather bought them for her. I just remember that they were big – big as those ‘blooming onion’ appetizers – and no two were alike. Oh, I’m pretty sure one of the bushes started out red and one started out yellow, but in my memories, they were always combinations of the two, the colors swirled together as if someone had stirred two colors of paint in a bucket and dipped the blossoms into it. 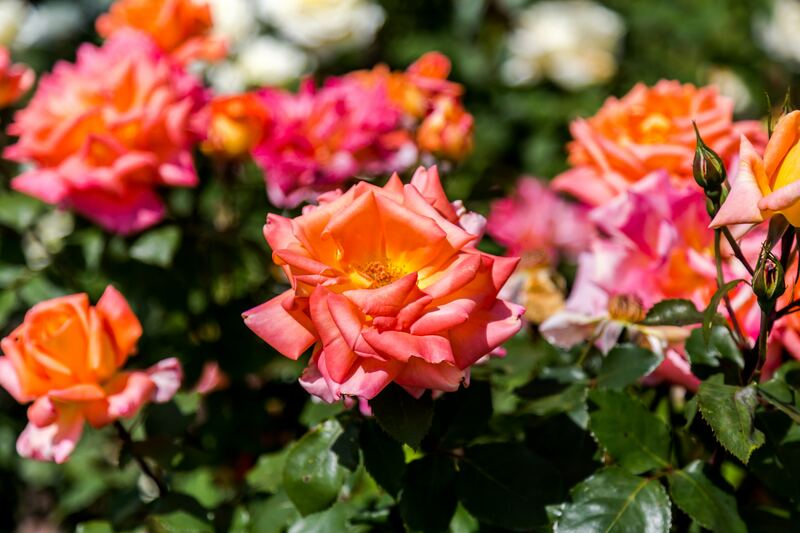 My childhood summers were filled with those roses. Outside, on hot summer days when we weren’t at the beach or visiting someone with a swimming pool, we’d run through the sprinklers, careful not to step too close to the rose bushes. Bare feet and huge thorns do not mix well. Inside, roses were everywhere. If a blossom broke off the bush without enough stem, she’d float it in a bowl of water. Otherwise, any vase or vase-like container was pressed into service. Old juice bottles, proper crystal vases, a tall glass that no longer had any mates, even a chipped milk pitcher might be found on a side table, a window sill, a nightstand, a bathroom counter with a rose or three. And the petals! When the flowers dried naturally my grandmother saved the petals, creating her own delicate potpourri, pots of petals in every room of the house. Somehow, though, the scent was never cloying, only a gentle, wafting presence, sweetening the air. Less frequently, my grandmother would decide to press the flowers, and dry them that way. For years, if you pulled a thick book – the dictionary, a big red book of fairy tales (two volumes of those, actually), even the Bible – you might have a pressed flower land in your lap. After she died, I even found one in her ancient address book, at the bottom of her knitting bag, which had been unused for years! Sometimes, on rainy Sundays, my husband and I will pass one of those street-corner tents where they sell roses for $10 or $20 a bunch, and I almost – almost – want to stop and buy some, but we never do, because hothouse roses never have any perfume. They’re like illusions of roses: all form, no substance. And sometimes, when I’m sad or not feeling well, I’ll lie in bed in that state halfway between dreaming and waking, and I’ll feel my grandmother’s cool hand stroke my brow, and I’ll breathe in the scent of roses – the scent I’ve associated with her for as long as I can remember. 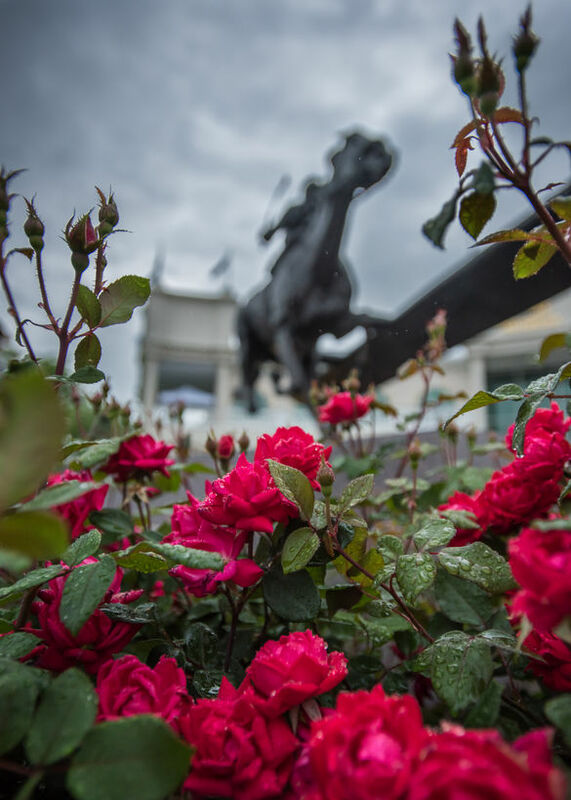 Yesterday evening, in a steady rainstorm, twenty-three colts made a run for the roses in the 144th Kentucky Derby. But me? I’ve been running away from commercial roses for as long as I can remember. I’ve also been running for the backyard roses of my childhood for half my life, and they remain elusive as ever. When we ask people to do studio tours, we do it for two reasons. 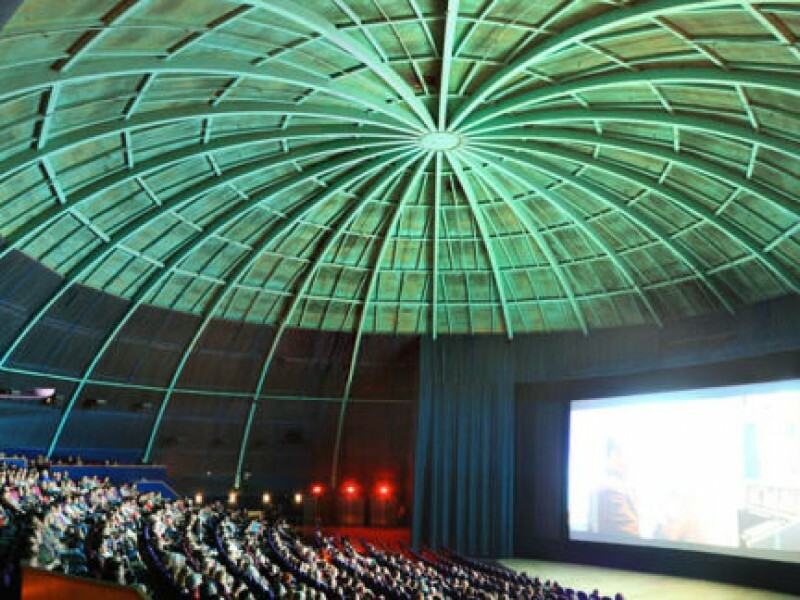 One is that it gives us, and our readers, a sense of the person giving the tour. What you keep on your desk reveals more about you than you might be comfortable stating in a conversation. The other reason is that it gives us (and our readers) ideas for decorating/modifying/changing our own workspaces. It’s a great cycle of sharing and inspiration. I’ve long been the kind of person who likes to switch things around from time to time. Changing the position of a chair, or a table, or a couch can change the energy of an entire room. For years, every time my husband went away on a work trip, he would beg me not to move furniture while he was gone. Partly, he didn’t want me to hurt myself, but partly, he didn’t want to come home to a house that had a different layout from when he left. A recent diagnosis of a torn ACL (surgery will be in early summer) means that I’ve been forbidden to climb stairs, so Fuzzy and I spent last weekend (with the help of a friend’s kid who was willing to work in exchange for being taken to lunch) turning our formal dining room into my office. To be honest, I’ve had designs on this space since we originally looked at this house almost fourteen years ago. 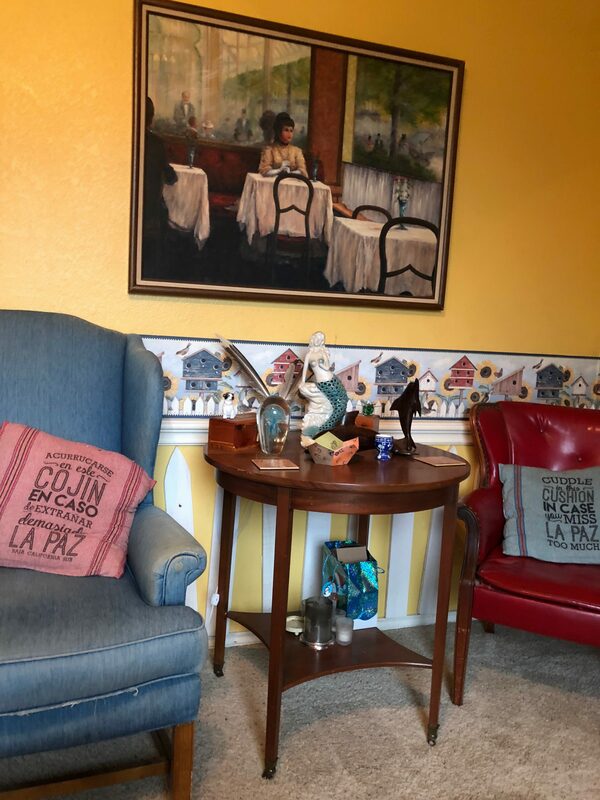 The original owners had been using the dining room as the headquarters for their home office, and I wanted to do the same. Instead, Fuzzy and I each claimed one of the four upstairs bedrooms (our bedroom is on the ground floor), eventually turning the other two into a dedicated guest room and a library. In the time we’ve lived here, I’ve moved offices several times. Originally, I was set up in the room across the hall from Fuzzy’s, so we were both in the same ‘wing’ of the house. When I quit the mortgage industry and started doing audio work, I moved to the big room (really a second living area with a token closet) on the far side of the house, which had room for my weight machine. I moved back to the smaller room when a friend moved in with us for a while and reclaimed the big room when I realized we’d made life here too cushy, and that he’d never leave (he’s since left). So, change is something I embrace. But I hadn’t expected our rearranging to click as well as it has. Two years ago, we bought a library table and four chairs to use in the kitchen, and I joked that if we ever got tired of using it in that room, I’d want it as a desk. Well, now my parents’ old teak table is back in the kitchen, and the library table is positioned across the arched front window in the dining room. 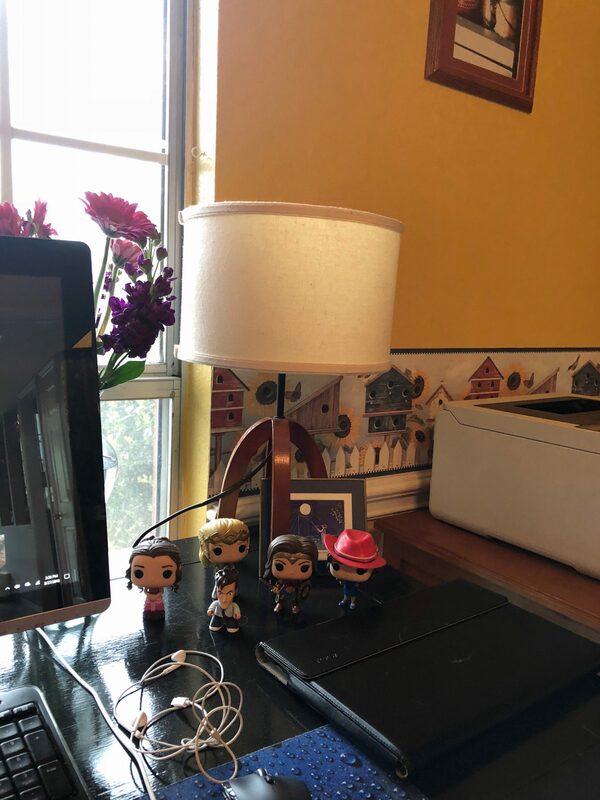 We brought down a desktop credenza (it’s full of envelopes and postage stamps, sealing wax and staples) and my collection of geeky toys to make the space feel like my space and not just a temporary change. After all, I’ll be avoiding stairs until almost the end of the year. A printer stand we’d been using as a coffee table (and which is full of board games) is now holding an actual printer, and my grandfather’s red leather chair is sharing space with an ancient denim wing chair we bought in 2002 so I have a special place to sip coffee or tea and read. We couldn’t move the hutch, but since it holds my collection of Día De Los Muertos art, it feels appropriate. One of my pieces is even a mermaid! 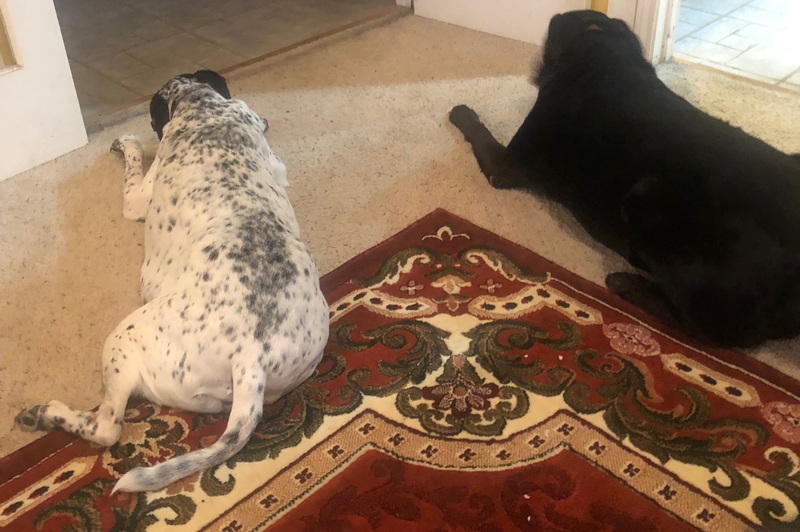 Possibly the best part of this space is that, since there isn’t a coffee table occupying the center of the room as there is in my upstairs office, all the dogs can roam in and out or sack out on the carpet without ruining anything with the stray swipe of a happy tail. I expected this switch to be convenient. And so, this latest revamping of our household, meant to accommodate my injury, has become an artistic and creative boon. I’m working surrounded by art pieces that we’ve collected and acquired over the years, and my own toys. I have a window that looks out to the front of our house, and the daily routine of our neighborhood. I’ve even found that the sunny yellow walls, rather than being too bright for every day, are warm and cheerful. I told Fuzzy, and many other people, that I love this new space so much I might not relinquish it once I’m allowed to use stairs again. Fuzzy’s okay with that, though, as long as he can have the room I vacated. It has a full-sized sofa in it, you see, which is perfect for those all-night maintenance calls he sometimes has to monitor. Do you have a dedicated space for your work or creative endeavors? Do you ever want to change things around in your house, just to see how it feels? Last month, I wrote about the first few days of an intense writing challenge I was part of: writing twenty-eight plays in twenty-eight days. The project, sponsored by Theatre Delicatessen in London, involved a couple of hundred writers from around the world (mostly in the U.K., though) and one Evil Overlord (well, he’s not really evil) named Sebastian. Every day at 4:00 PM (U.S. Central Time), we’d receive the daily brief from Sebastian, and then we’d have thirty-six hours to write a play using his brief for inspiration, although the last twelve hours of a given brief overlapped with the first twelve of the next. Very quickly, I began to question the wisdom of committing to the project. I’d never written a play before (not really, anyway) and I spent a good chunk of the first week fighting with formatting. WORD, my software of choice, has a downloadable screenplay template, but not one for stage plays, and even the screenplay one is kind of klunky. Eventually, with some encouragement from friends, I scrapped the template and did my own thing. Freeing myself from the constraints of someone else’s formatting did much for my mindset. But I was still floundering. The first few briefs had been relatively simple. The initial prompt, for example, was the phrase, “Brave Little Soldier,” with bonus points for setting it in your hometown. Well, my actual hometown (as opposed to the town where I live) had a significant number of losses when the towers fell on 9/11/01, so I made my characters the adult children of people who had died that day. Emotional, yes, but relatively easy. As the challenge progressed, the briefs became more demanding. When I wrote about this in February, I mentioned the first weekend challenge, about nightmares, but once I got past my fear of the material (my nightmares are weird… and personal…) I ended up having fun with it. After all, the brief also said we had an unlimited budget to work with. More than once, I was tempted to throw my laptop into the pool and never write again. Ever. More than once I whined to friends, family, and the dogs – basically whomever would listen, or pretend to – that I was too stupid or too boring to respond to these things that expected you to come up with edgy, even avant garde ideas. More than once my husband had to talk me down from the proverbial ledge. My friend Clay, the Creativity Guru I mentioned in my previous post – the one I’d convinced to do this challenge with me – finally gave me the key to my frustration. That conversation became my guidepost, and parts of it morphed into a mantra, over the rest of the month. And as things evolved, it turned out that the briefs I balked at the most, or felt like I had nothing to offer for, ended up resulting in my best work. An instruction to “write shite” and “let yourself go” inspired me to pull a bunch of my notecards (sticky notes leftover from the 100 Days of Making challenge, each with a scene, sentence, or snippet of dialogue) off the fridge and order them into a play. A couple of weeks later, given a time-restriction exercise, I went back to the fridge for more notecards, and I really feel that the two plays that resulted from those – “Scenes From a Marriage” and “Theories of Everything” – are the most cohesive of my creations. But there are others I’m proud of. The math brief led me to a piece where the dialogue was all based on the Fibonacci sequence, and mentioned Phi and the nautilus shells. (“Nautilus”) A brief asking us to interview people and then write a monologue suitable for teens, making it seem as if it was one person speaking, gave me “Wo(Man)Hood” about a young woman who experiences anxiety but is also bi-gender, and a brief asking us to write about truth and art inspired me to write a monologue about body positivity – and the really cool thing about that one is that when my friend Nuchtchas read it, it inspired her to make art. If just reading that gave you pause, you’re not alone. And I admit, I whined about it and railed against it for a good chunk of my available writing time. But in the end, I ended up with a play called “Frapping Pachelbel,” where all the characters were the instruments in a string quartet, except the Conductor, and Cello complained about their part, but in the end Viola was jealous over Conductor’s relationship with Cello, and started a duel (with bows used as swords, obviously) and everyone died. Admittedly, it was kind of silly, but being outrageous felt like a breath of fresh air at the halfway point. Others of the difficult challenges were less happy. One of our challenges was to write something that would offend people. The obvious choice would have been using a lot of blue language – and honestly, that was one of Sebastian’s suggestions – but after nearly twenty hours with zero ideas, a meme posted in a feminist forum I belong to resulted in a play about the way men who commit domestic violence are not out of control, but so very in control that a group of them was able to come to a consensus about how long to wait, after starting a new relationship, before actually abusing their partners. Writing it made me squirm, and after I submitted it, I had to have my husband bring me a mug of cocoa and stay with me for cuddles. The final week was my favorite. One challenge was to complete an unfinished piece of our own writing. Since I didn’t have any unfinished scripts, or any scripts from the challenge that I was ready to revisit, I adapted one of my own pieces of flash-fic into a play: “The Weather Man,” and for the penultimate challenge, which was to pick a previous challenge and go a different direction with it, I asked two of the people who’d read everything to pick for me. My friend Fran asked me to revisit the challenge that required us to begin with this line: “Take of the girdle, Gertl, and tell me everything about Onun’s onions, or else little Dicklberg here will get it.” My first use of the line went in a science-fiction direction. My second use, for challenge 27, went to a more noir place, though, technically, there was a voiceover line before the first exchange of dialogue. Still “Up in Smoke,” is one of the pieces I’m really proud of. So. What did I learn from this experience? 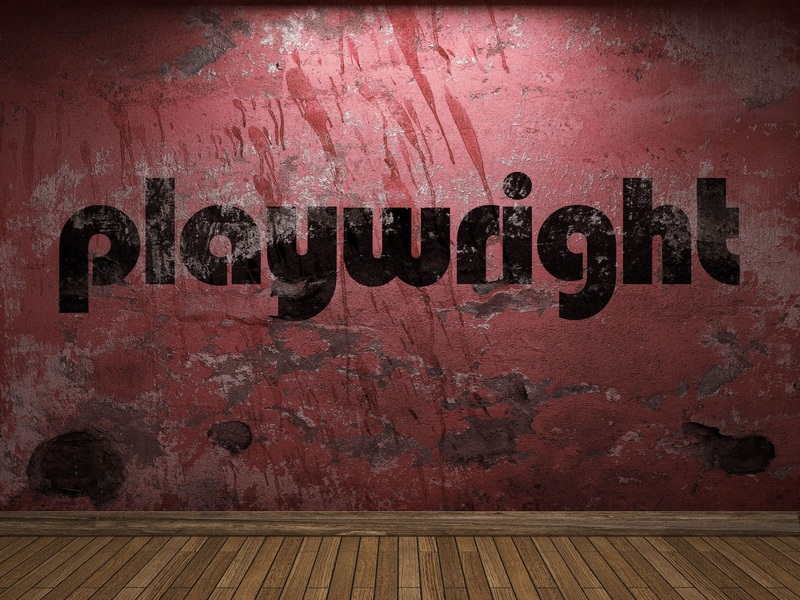 Well, I’m probably never going to be a playwright – and that’s okay, because I don’t really want to be a playwright. 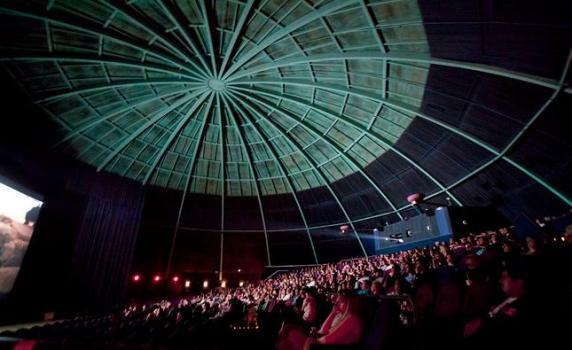 I much prefer to watch theatre or perform on stage. When it comes to writing, essays and narrative fiction are where I’m really comfortable, and I prefer to exercise those muscles. Still, it’s good to stretch, from time to time. I accomplished something that scared me, and I learned a lot about myself, as a person and as a writer, in the process. Will I participate again next year? I wrote a play yesterday. Actually, I wrote plays on Thursday and Friday as well, and, with the exception of a couple of audio drama scripts for which an outline was provided, these are the first three plays I’ve ever written. I don’t have any plans to become a professional playwright or screenwriter. In fact, these last three days have taught me that I vastly prefer writing straight narratives to scripts, but I’ve committed to a challenge to write twenty-eight plays in twenty-eight days, and even though I want to quit about once an hour, my husband and the friends who are following this process with me won’t allow it. Truthfully, I won’t allow it, either. Even more truthfully, I don’t think I’ve felt as unprepared or afraid of a creative project since the night I walked into the West End Market in downtown Dallas to audition for ComedySportz. While I’m not an organization queen, or even a basic list-maker, I do like to be somewhat ready for these undertakings. When I’m auditioning for (or have been cast in) an acting role, even if it’s just bit part in an unpaid audio drama, I make sure I’ve read the whole script (not just my part), listened to a few episodes to get a feel for the piece, and/or done research on the setting, theme, and creators. I won’t interview authors unless I’ve had time to read their books, and when I used to interview celebrities for All Things Girl, I made sure I knew their work, but also what sorts of questions they’d responded to favorably in other interviews. But this project, “28 Plays Later,” which is sponsored by Theatre Delicatessen in London, isn’t something I could really prepare for. I mean, I didn’t even know about it until sometime in January, and the first prompt was issued at 4:00 PM (U.S. Central Time) last Wednesday. I’ve been in plays and musicals, and I’ve read a lot of scripts, but I’ve never really tried to write one. When I told some of my friends what I was doing, I was asked if I could pre-write anything. The prompts, however, are useful. They give you a jumping-off point. They also foster community, because we all discuss how we’re interpreting the instructions. Yesterday’s assignment was to use our dreams and nightmares as fodder for a surreal piece of theatre. We had an unlimited imaginary budget and were encouraged to create ‘hallucinatory images’ and disrupt order. Despite the fact that I’ve been dabbling in writing horror for almost the last six months and consider the original A Nightmare on Elm Street to be one of the best horror movies of all time, at least conceptually, I was in tears as I tried to figure out how to approach this challenge. I’m not proud of it, but I complained about having no ideas to everyone who would even pretend to listen. I asked my husband for ideas. I whined about the fact that I don’t know how to translate things into a visual medium. I even asked a friend who is also participating if Day Three was too early to quit. “If I asked the same question on Day Fifteen would your answer be the same?” I demanded. And so, even though I’m typically nocturnal, and my husband had an online game event that was going to keep him awake until well after three in the morning, I went to bed at midnight, with a frustrated brain and a discouraged heart. Three hours later, I was awake again, dragging my laptop into bed with me, doing research on the amygdalae – the two almond-shaped clusters in the human brain where emotions and memories live. Two hours after that, I had an outline of a three-act play that included nightmares, tangos, Dracula, Winnie-the-Pooh, and a finale that took place on roller skates. By nine yesterday morning, I was awake again, and writing like a demon, until, finally, I had twenty pages of script that involved a Dreamer giving lessons in ‘dreamology’ and a Child going through her safe sleep ritual. Is it next year’s Tony winner? But writing it forced me to stretch beyond my creative comfort zone, to try new things, and think of new ways of expressing old concepts. I wrote a play yesterday that scared me, just thinking about it. I was sure I would miss the deadline and fail the challenge. Instead, exhausted and jumpy, I wrote – and shared – something I never thought I could start, let alone finish. Now, I’m going to brew a pot of tea and maybe open one of the boxes of Girl Scout cookies that my husband bought for me, and then I’m going to do what I did yesterday. I’m going to write a play. Silence. Most of us either love it or hate it, sometimes both depending on the circumstances. From our earliest ages we’re taught that certain places are meant for silence. We are shushed in church, and reminded to be quiet when we visit libraries. We write poems about silence, repeat proverbs about it, and even sing songs lauding it, or, in the case of lullabies, we sing songs to coax it from others. But those early types of silence, the enforced silences, are radically different from the kinds of quiet, of silence, that we embrace as adults. We might take our morning coffee out to the deck or patio to enjoy the quiet of an early morning. We make time in the middle of a busy day to meditate or pray. We seclude ourselves in the bathroom and soak in a scented bath in the evening. And in all those moments, we think we’re experiencing silence, but really, we’re not. What we’re truly hearing is the lack of intentional sound. We may have turned off the radio, set our phones to do not disturb, or locked the bathroom door against chattery interlopers, but that isn’t really silence. 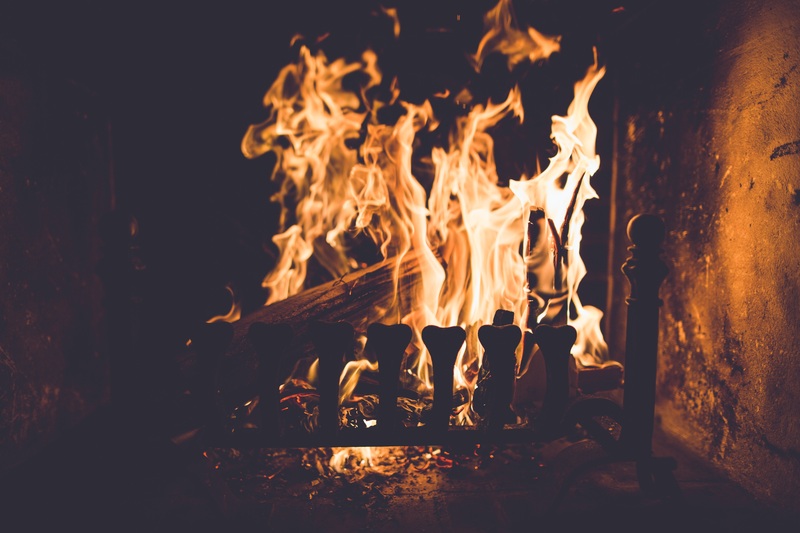 Last Wednesday evening, my husband and I sat in our darkened living room and listened to the crackle of the fireplace. We’d just finished eating tacos by candlelight. It wasn’t the meal I’d planned for us – I try to limit our ‘wrapper food’ to the occasional lunch – but the power had gone out late that afternoon, and our house has an all-electric kitchen. It was late enough in the day that neither of us had fully-charged phones or laptops. We’d received an initial text that power would be restored at five pm, then seven, and finally midnight. It was supposed to dip below freezing that night – not as cold as the conditions our friends and family in the Midwest and Midlantic states were experiencing, but cold for Texas, where houses are built to shed heat, not retain it. So we stoked the fire, and we lit all the candles and we brought blankets out to the living room and cuddled on the couch. We played games on our phones while we could, but eventually, we lapsed into quiet. It’s a strange thing about modern life. We so rarely experience true silence. Even when snow blankets the world with its special, magical hush, we are still surrounded by electrical hum. But when the power is out… when the fridge ceases cycling and the clocks stop blinking in digital blue or green… when light pollution is suddenly dimmed… that’s when silence truly falls. As a rule, I’m not a fan of silence. I can’t sleep without white noise distracting me from the external house sounds that come with life in outer suburbia and muting the often too-loud thoughts inside my own head. Last Wednesday, silence was an annoyance. I complained loudly to my husband. I even texted one of my friends that it was too quiet, that instead of being soothing, the silence felt oppressive and creepy. But eventually, I relaxed into the softness, the cool darkness, and the almost perfect soundlessness. I went to the bedroom to curl up with my dogs and let the steady sound of their breathing – the only discernable noise – lull me into sleep. My husband guarded the fire until it had burned low enough that it was safe to leave it, and then joined me in the bed. We lay together in the darkness, not speaking. Not really touching. Just breathing in the silence. Shortly after midnight, the power returned, jarring us out of our quietude and into wakefulness. I wish I could say that we looked at each other, laughed, and turned the lights back off, but we’re tech addicts and habitual night owls. We went back to bed around two in the morning, our usual hour, but something of our evening of enforced silence lingered. We were gentler with each other that night and the next day, more mindful. I’m still not fond of silence. And I love the peacefulness of snuggling on the couch with my husband, not talking, not watching television, just being together.